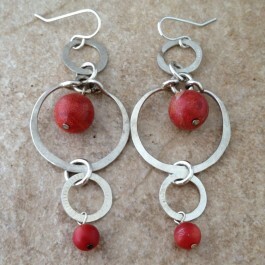 Three hammered sterling silver hoops, two small and one large, are accentuated by two natural coral beads. Heavy gauge sterling silver circles, one large and two small, are hammered to a satin finish. Two coral beads, one large and one small, add just enough warm color to the cool silver metal. Large earrings but lightweight and comfortable to wear. About 2 5/8" long and 7/8" wide.